We know there are a few questions when it comes to participate in a big festival. Therefore we have gathered the most frequently asked ones and tried to answer them. Nevertheless, if your question is not answered here don´t hesitate to contact us and we will discuss all topics. The answers given below are based on our experience of the past festivals. Please note that all questions related to the schedules of the individual groups, as well as travel and accommodation will become clear once the individual ensemble itineraries are finalized. Where will the different festival events take place? We are proud to offer Vienna’s two most prestigious concert halls to our participants: The Golden Hall of the Wiener Musikverein for the Competition and Celebration concerts and the Great Hall of the Wiener Konzerthaus for the Gala Winners’ Concert. Additional concerts take place in different venues, for instance at the MuTh – Concert Hall of the Vienna Boys’ Choir, or at the Haus der Musik (House of Music) Vienna. Workshops will take place at the University of Music of Vienna – and all participants will be welcomed at the Opening Ceremony in Vienna’s St. Stephen’s Cathedral. Which instruments will be provided by the festival, what about music stands? Please do not take your own versions of the above mentioned percussion instruments to the stage and use the provided ones. Make sure that your stage crew consists of enough persons and is briefed on this matter. The SCL festival staff will guide them during set-up. Please also note that those instruments and music stands are only provided at the Musikverein / Konzerthaus and MuTH Concert Hall. At all other locations you have to use your own percussion instruments and music stands. Additional instruments and technical equipment are generally not supplied by the SCL Festival. Should additional equipment be required, the participants are asked to contact the SCL Festival for organizational assistance as soon as possible. Costs accrued by the hiring of additional equipment are not carried by the SCL Festival. Why may I not take pictures inside the Musikverein and the Konzerthaus? No photo or video equipment is allowed inside the Musikverein and Konzerthaus. This is not the festival policy but a requirement of the venues. Our staff is instructed to act accordingly. However, festival photographers will be present at both venues and the photos taken will be forwarded to all participants after the festival. These photos are not for commercial use. 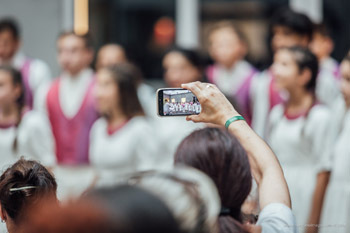 All other photos and / or audio / video recordings taken on the premises of the Musikverein / Konzerthaus must be previously authorized by the respective management of the and by the SCL Festival. The SCL Festival is entitled to prohibit photos and audio/video recordings of the events taking place during the Festival. What is the dress code for visitors of SCL Festival events? Generally the dress code for all events differs according to the venue. Opening Ceremony in St. Stephen's Cathedral: As St. Stephen's Cathedral is a church, clothing should be chosen accordingly (e.g. no shorts or strapless tops). Conductor's Dinner: No dress code applies. As the conductors' meeting takes place immediately after the opening ceremony in St. Stephen's Cathedral, no change of clothes is possible or required. Gala Winners' Concert in the Konzerthaus: The Konzerthaus does not officially require a certain dress code. Considering the festive occasion, we would however suggest smart casual (no shorts, t-shirts). Suits and evening gowns are not required but are also appropriate. Overcoats, bags, rucksacks and umbrellas must be left at the Konzerthaus or Musikverein cloakrooms for security reasons. Farewell / Closing Ceremony in Vienna's Town Hall: See Konzerthaus. No change of clothes required. All other events: For all other events and venues no dress code applies. Will festival staff be present during the events of the festival? Our friendly festival staff will be present at all venues of the festival and will guide you through the events. Should you have any questions, complaints or suggestions please do not hesitate to speak to them! Who will witness the SCL Festival? How can we contact our fellow participants? It is our aim to encourage our participants to get in touch with each other at one of the many opportunities given during the festival time. Should you require any contact information please tell us. You can also visit the page Impressions on our website. Definitely! We are constantly working on improving our festival and we depend on the feedback of our participants. Conductors and / or ensemble managers will receive an electronic questionnaire after the festival. Your feedback is greatly appreciated. What can I do if my question has not been answered in the FAQ’s? How can my ensemble qualify to participate? Every group regardless of nationality can apply and will be informed of its acceptance to the festival as soon as all necessary information has been supplied. Participants have to be younger than 26 (10% may be between 26 and 30, conductors and piano accompanists can be older). How do I apply and how long can I apply? First of all we need you to send us the application form with all the required information. You can apply until the 15th of February of every festival year. We require some material from you - most of it can be sent electronically. For further information please click on application and have a look at our explainer-video. All necessary documents can be found in our section: Downloads. Where can I find the required music pieces? Please find a list of all compulsory music pieces for the competition performance and the workshops for each category on the corresponding links. There you will find for each category a section "Compulsory Music Pieces" and "Workshop Pieces" that lists the required works. You can also find the list with the titles of the required music pieces on our "Downloads" site. What can I do if some of the data I have submitted is incorrect or has changed? We try to accept changes as far as possible. No changes will however be accepted after the 15th of April of the festival year. Why do you need a data list of all the participants? As every participant will receive a personalised certificate during the Closing Ceremony a list with the names of all participants is required. We want to offer you the best possible service. Therefore all other required data (i.e. age of participants, corresponding instruments, respectively voice, etc.) are very useful to us in order to ensure a smooth application process for all ensembles. What will be happening during the opening ceremony? Participants will be welcomed by the Artistic Director of the SCL-Festival. Every participating group will chose one of its members to introduce the ensemble on stage. There will also be a brief musical program. At the end of the ceremony all participants will sing the anthem of the SCL festival (see Downloads). The text and the scores will be provided. Please note that the seats inside the cathedral will be allocated to the ensembles by our festival staff in order of arrival. Due to the organisational matters no exact seating area can be determined or guaranteed prior to the arrival of the cathedral. Where will the conductors’ meeting be and how will we get there? What will be happening at the Conductors’ Meeting? The conductors’ meeting is an opportunity to meet your fellow conductors and to speak to our artistic director about any last minute questions on artistic issues. Please note that all conductors are asked to assist the meeting. You may of course bring a spouse, chaperone etc. Please note that however due to the limit space only two persons per ensemble are admitted. What is the difference between the Competition and the Celebration? Participants in the Competition will be judged by a professional jury. 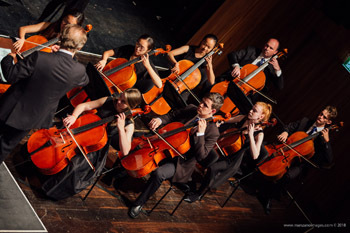 The best groups will have the opportunity to perform in the Gala Winner’s concert, one of the highlights of the festival. Participants that do not wish to compete can take part in the Celebration. This means that they will perform in the Musikverein before fellow participants in a short daytime concert. Both the participants of the Competition and the Celebration take part in all of the other events of the festival. Can we rehearse for our performance in the Musikverein or in the Konzerthaus? There is no rehearsal space, neither in the Musikverein nor in the Konzerthaus, apart from the dressing rooms – therefore no proper rehearsals or sound checks are possible once the group is in the building. All the ensembles are kindly asked to tune their instruments in the dressing rooms / warm-up area. What will be happening during the workshops? You will be attending two workshops in the University of Music and one additional lecture, each of which will have a length of approximately 40 - 60 minutes. The workshops are aimed at practicing various music pieces. 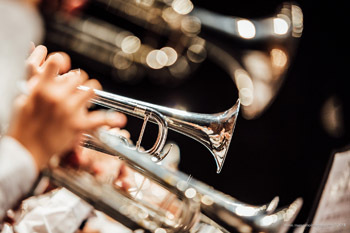 For the orchestras and bands, workshop pieces must be prepared by the groups and will be practiced during the workshops. You can find the workshop pieces (PDF) in our Downloads section. Who will be conducting the workshops? The workshops will be held by members of the festival’s choir, orchestra or band jury, as well as other qualified lecturers. Please note that due to the schedule and the limited time it is not always possible for jury members to give additional feedback on the group’s performance in the competition. Will there be more than one group attending a workshop? If at all possible we try to organize the workshops in a manner, where the choirs can sing together. Depending on the size of some groups and the logistics involved, this is however not always possible. Do we have to bring our instruments? Yes, all orchestras and bands need to bring their instruments in order to work on the workshop pieces. Please think of the additional time required. Piano will be supplied for choirs attending the workshops. What can we do in between workshops? If the schedule and the size of the lecture rooms allow, participants are encouraged to visit other workshops and seminars. What are the additional concerts? In addition to the performances in the Musikverein, each group will be attending 2 additional concerts in and around Vienna in the length of 25 – 80 minutes. There will be a local audience (and sometimes fellow participants) present at the additional concerts, its size depending on the festival-partner responsible for the event. How are the additional concerts allocated to the groups? Due to organizational reasons it is not possible for groups to pick a certain additional concert. All concert locations are special and are chosen for the groups depending on the overall festival schedule and the schedule of the group concerned. Concerts are held in Vienna and in the vicinity of Vienna (not more than approximately two hours’ drive from Vienna). Will there be tickets for the additional concerts? Apart from a few exceptions the additional concerts are held free of charge. What will be happening during the photo shoot? All groups will be asked to arrive before the Gala Winners’ Concert for the group photo with all the participants. The photo shoot should not take more than 15 minutes if all groups are on time. After the photo shoot the groups have free time until the concert starts. Who gets to perform in the Gala Winners’ concert? Only the best groups in the Competition will perform in the Gala Winners’ concert, as selected by the jury. It is our aim to let as many groups as possible perform, which means that there can be no clear rule as to who will get to perform (e.g. all finalists of each category). What will be happening in, before and after the Gala Winners’ concert? Before the Gala Winners’ concert, all groups that will be performing are required to be present backstage. We do try to make your stay as pleasant as possible but please note that we are stretching the capacities of the venue in order to have as many groups as possible perform. This means that there will be groups in the entire backstage area and we have a very tight schedule – please comply with the instructions of our staff. In the Gala Winners’ concert each of the selected groups will perform a piece chosen by the jury before the next group comes on. Musicians can watch the concert in that half of the concert, which they are not performing in. Owing to the resulting disturbance of the audience, no one may enter the concert hall during the performances. Can we rehearse for our performance in the Konzerthaus? There is no rehearsal space in the Musikverein or in the Konzerthaus apart from the dressing rooms – therefore no proper rehearsals or sound checks are possible once the group is in the building. You will however have the chance to tune your instruments in your dressing room. What will be happening in the closing ceremony? After dinner every group will be awarded their respective certificates, including individual certificates of all participants (should the participants not have received their certificates during the Gala Winners’ concert). The group certificate will show the category and the ranking achieved in the competition (if applicable). One representative of each group (preferably the conductor) will be asked to come on stage to receive all the certificates for his / her group. Please note that no alcohol will be served to participants at the closing ceremony. How will I know when to be where during the festival and how will I get there? Considering that the festival organization and the organization of travel and lodging are very closely linked, you will receive a detailed itinerary including all services (travel, meals and lodging, all the venues with exact schedules etc.). Once we have received all of your documents, we will send you a personalized link to our homepage, where you can find a presentation of your group and the appropriate schedule. The SCL festival and Concerts-Austria staff is in constant contact, assuring your timely arrival and departure to and from all festival venues. We are planning on touring in Europe before or after the festival, do you offer any support? Our inbound travel partner, Concerts-Austria is one of the best music travel agencies in Austria and is well equipped to handle all of your travel during, before and after the festival. Feel free to present your travel plans or ask your local travel agent to contact Concerts-Austria.